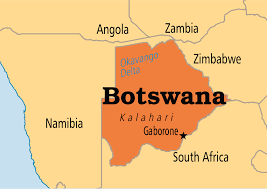 Botswana and Namibia have signed an extradition agreement in aimed at giving effect to successful arrests and law enforcement procedures between the two countries, APA learnt here Wednesday. The two neighbours also signed an Agreement on Mutual Legal Assistance in Criminal Matters. The treaties were signed in Gaborone by Botswana's Defense, Justice and Security Minister Shaw Kgathi and Namibia's Justice Minister Sackeus Shanghala. “The Extradition Treaty provides the framework for granting extradition of fugitives while the Treaty on Mutual Legal Assistance in Criminal Matters facilitates the exchange and cooperation in criminal matters, including investigations, prosecutions and the exchange of information and documents,” Kgathi said during the signing ceremony. Shanghala said the signing of the treaties would go a long way in ensuring the rule of law prevailed between the two countries. “The instruments came at the right time when crime such as human trafficking and other heinous acts are on the rise," the Namibian minister said.